Well, following a trip to the Festival of Railway Modelling at Alexandra Palace this weekend, I have almost the last items I need to complete my layout. If you’re going to have a non-specific factory, you’ll need box vans. For some reason, decent (i.e. not Triang, not Dublo, not Hornby-garish-private-owner) vans seem to be hard to come by. 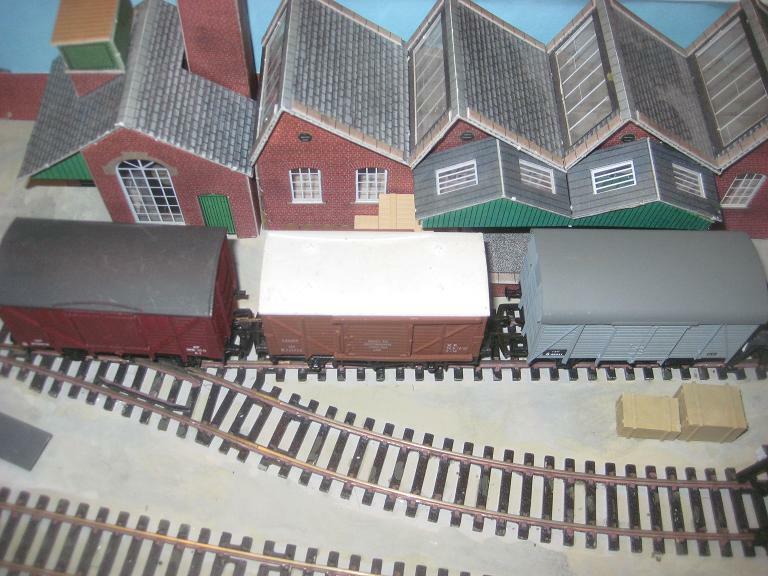 These ones are, left to right, a Dapol meat van, a Mainline Vanfit and a Hornby ex-Southern Railway van. I’ve tried to get some variation in terms of shape and colour, just to make shunting a bit more interesting. For some reason, I really like those Southern vans. I don’t know if meat vans were used for anything other than meat, but there’s one here anyway. Maybe it has the workmen’s lunch or something. Speaking of workmen, you’ll notice there are none. I’ve been trying to find some typical steam age factory worker types and they are very difficult to get hold of. At least, to the level of detail I’m looking for. I don’t want something ready-painted, because frankly ready-painted figures look terrible. My brother is a wargamer, and having seen the results he and his fellow hobbyists get on their figures, the blobby paint jobs that seem to be the industry standard just won’t cut it for me. The big difference between the way wargamers do things figure-wise and the way we do things (generally) is that wargamers appreciate that one thing you can’t scale down is light. Therefore, they paint light and shade on their figures – starting with a dark base coat, adding colours, then adding highlights. The results are, comparatively, spectacular. This chap explains things far better than me. These are figures full of detail and character. The Workers, in the Railway Staff section, look to be exactly what I’m looking for, and I reckon they’ll come out just fine. I do have their Skipper and Vicar figures (I intend to paint them as Captain Haddock and Rev. W. Awdry respectively). The reason for my concern figure-wise is that, on a large layout, the somewhat short on detail and dubious-of-scale figures by Modelscene and Hornby would go unnoticed. On a layout this small, detail compromises tend to stick out like a sore thumb. That’s why I’ve been painting the track, as you see above. Still no ballast, but you know how it is. This entry was posted in Modelling techniques, My models, Rolling stock, Scenic features and tagged dart castings, micro-layout, model figures, modelscene, monty's models, wargaming. Bookmark the permalink.